Which Talent Management Vendor is the Best? Really? You thought I would make it that simple? I wonder what Siri would have to say about this. Well, for starters, Talent Management processes encompasses anything from acquiring and developing talent to measuring and recognizing performance to simply identifying the talent need. So with that in mind, the best Talent Management system is…………………..…….the solution that surpasses your business requirements and conquers your team’s fear of use of the product as well as respects your wallet. But no worries, finding that animate being is a lot easier with some help from the king of the jungle. 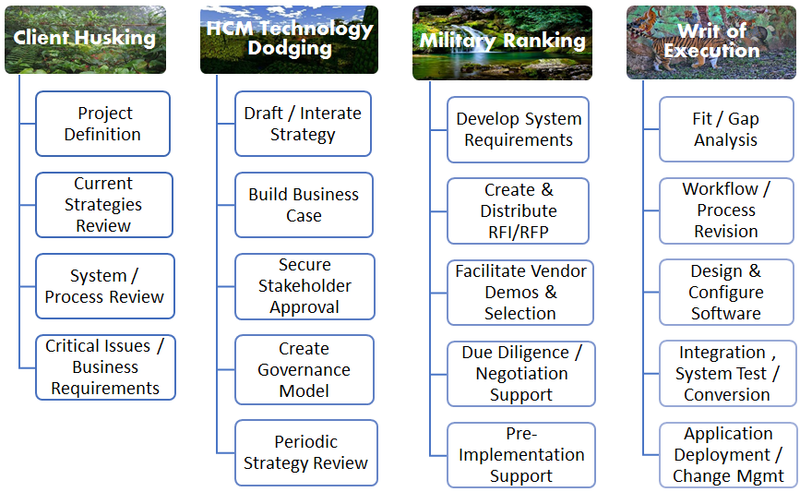 At HRchitect part of our daily hunting ritual is tracking not only Talent Management vendors but all HCM vendors who are fearless. So why use a tour guide like HRchitect, in the jungle? Because we know how to navigate through the waterfalls and avoid dangerous terrain. Let’s face it, in the jungle everything looks the same, so finding streams and rivers is our expertise! At HRchitect we benchmark data to justify your strategic direction while conducting audits of current systems and processes. If there was one best solution out there, then we would have just one best song ever or one best movie ever. So you see, the best solution for your organization starts with the simple understanding that although you can be your own Indiana Jones, wouldn’t it be nice to have Jungle Jane as a side kick?